We still consider this the best sweet corn for early maturity in indifferent summers. 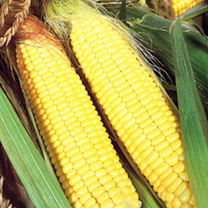 The cobs are some 18cm (7") long and close-packed with sugary kernels of creamy-yellow. Recommended for deep freezing. RHS Award of Garden Merit winner. This variety trialled, tested and recommended by the National Institute of Agricultural Botany. Sow singly in pots April-May in a warm greenhouse/frame. Plant out 35cm (14") apart late May-early June after hardening off. Plant in blocks to assist pollination and increase cob production. Harvest August-September. HEALTH BENEFITS: A gluten-free cereal and a source of fibre and vitamin B (For nervous system and the formation of new red blood cells). Typically less than 100 calories per cob! COOKING HINT: Cook immediately after picking for best flavour.